Publication drawing; chambered cairn, Crarae Garden. Photographic copy. 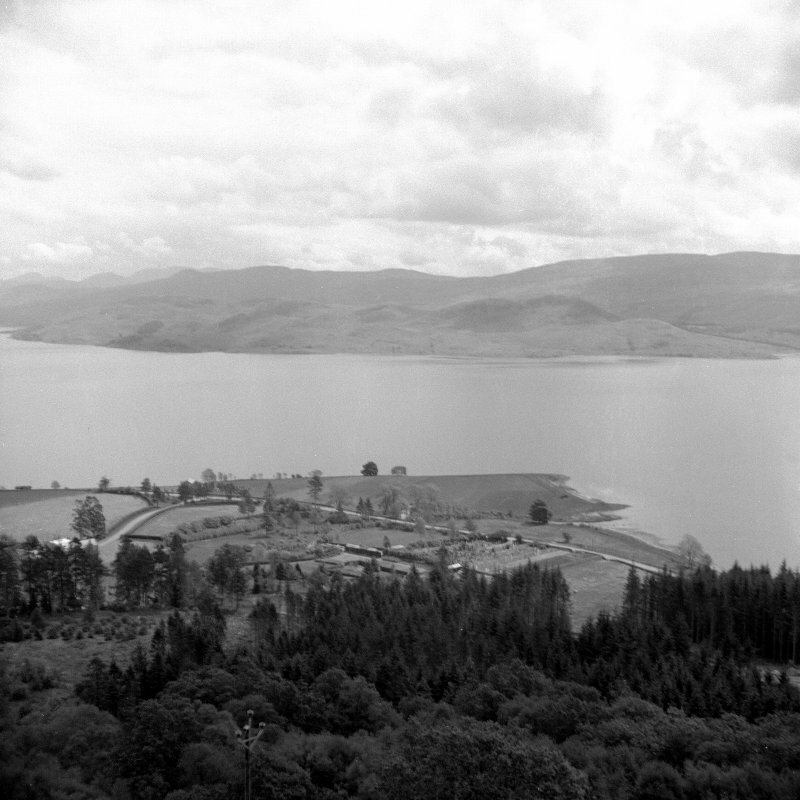 The Ordnance Survey Name Book [ONB] records "four stone coffins containing human bones and ashes" found here, which may be identified with the burial chamber of this Clyde-Carlingford chambered cairn, though only three segments were found in the chamber by Scott in his excavations of 1955-7. It was found to be probably trapezoid in shape, oriented E-W and measuring 115' by 60'. At the E end was an elaborate, almost flat facade, originally 35' long and a forecourt which may have been paved. A complex entrance, consisting of two sets of portal stones, leads from the forecourt into the burial chamber, the lower part of which survives, built of massive slabs, measuring 16' x 4'. Both inhumed and cremated burials had been placed in the burial chamber, accompanied by pottery - six sherds of rough, gritty material, possibly from a large round-bottomed bowl like that from Beacharra - were found, along with a possibly calcined lozenge-shaped flint arrowhead and hazel nuts. Finally, the entrance had been sealed by a stone slab and a blocking of boulders, which had been added to in more recent timed, pieces of slag iron, china, coal, and two parts of the upper stone of a rotary quern being found among them. 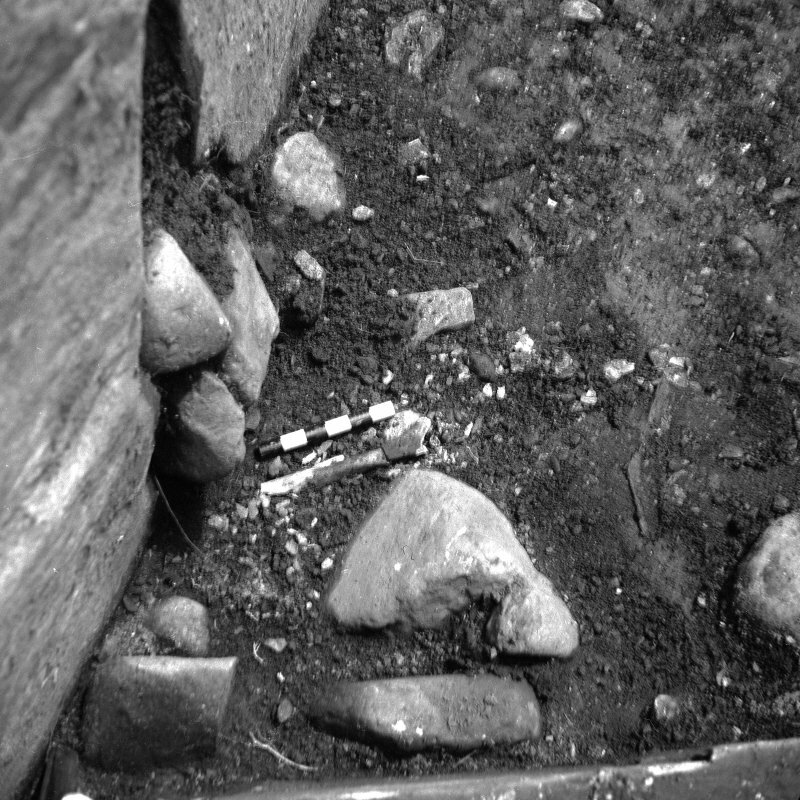 The surface of the forecourt at original ground level was very largely of loose gravel, darkened by charcoal fragments, and containing pieces of burnt bone. In a pit about 2' wide dug some 6" below the original surface at the S end of the forecourt was a deposit of c. 2,500 marine shells. The finds from the excavation are in Glasgow Art Gallery and Museum. After the excavation, the cairn was partly restored by the DoE by stabilising and in one instance, replacing, the side slabs of the burial chamber, and reconstructing the dry stone walling of the facade with stones which may have fallen from it. Burial chamber and facade, as described. This cairn is situated within the gardens of Crarae Lodge and lies on a slight rise in the raised beach about 175m N of the present shoreline (Campbell and Sandeman 1964; Henshall 1972). 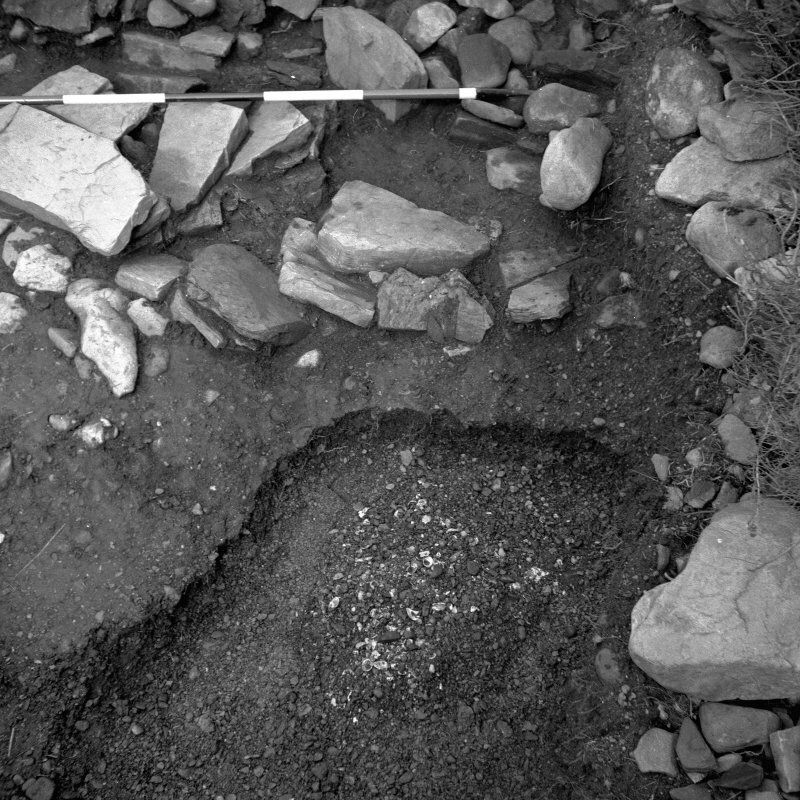 It was partially excavated in 1955-7 and the present account is based on the published report (Scott 1963). 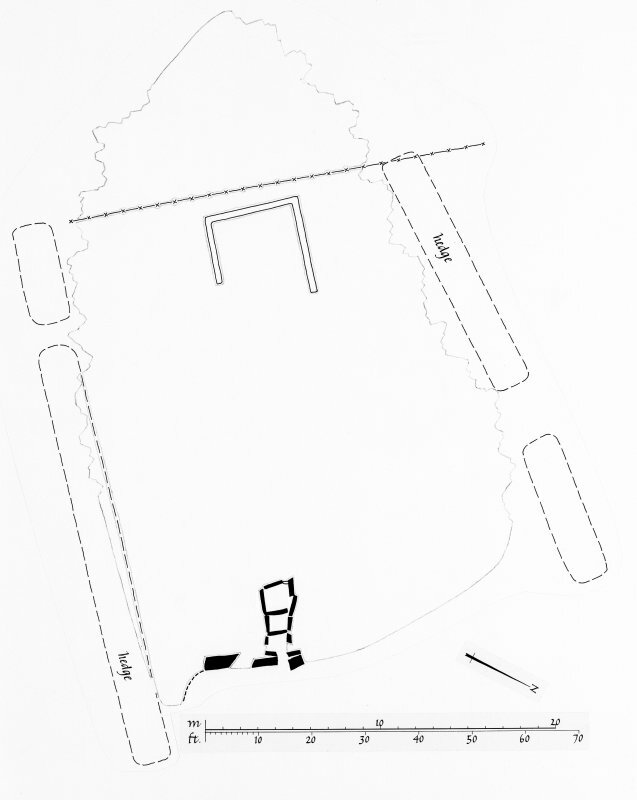 Although the cairn has been much disturbed and its outline obscured by garden features, it was probably trapezoidal on plan, measuring about 38m from ENE to WSW by 22m transversely, with a flat facade at the ENE end, through which access was gained to a tripartite chamber. Originally, the facade comprised a series of orthostats linked by panels of drystone walling; all that survives, however, is a single large slab on the S (2.4m high) and a pair of double portal stones (the present drystone walling is a modern reconstruction). The outer portal stone on the N is broken, but the S stone is complete and rises to a height of 2.5m, suggesting that the stones of the facade were graded in height, with the portal stones being the tallest. 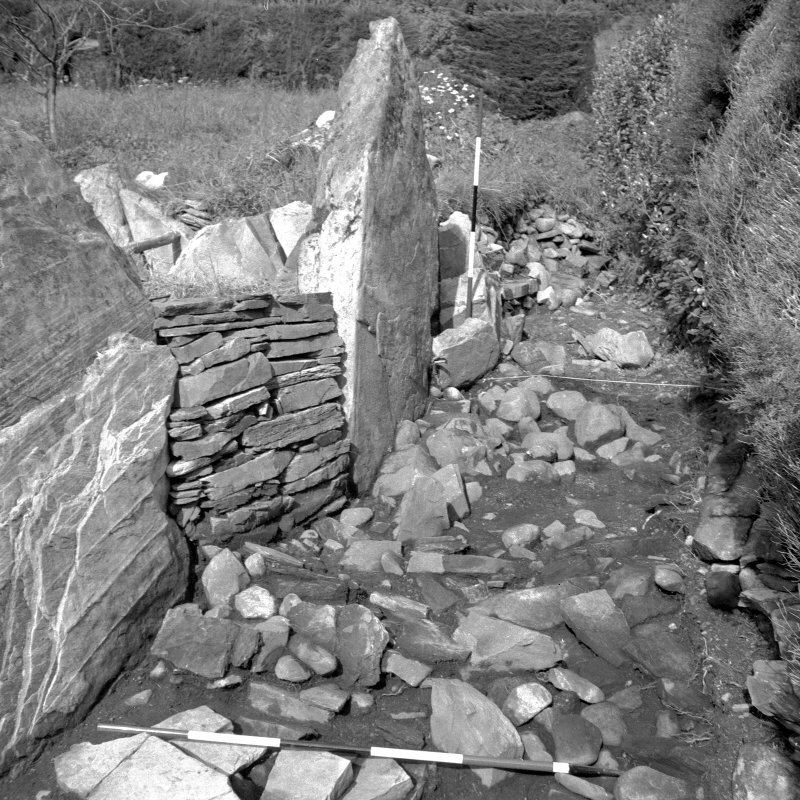 The chamber, which lies to the S of the medial axis of the cairn, is roughly rectangular on plan, measuring 3.9m by up to 1.4m, and was entered from the E through the rather narrow gap between the portal stones; the sides are formed of large slabs standing to heights of 1.2m to 1.7m, and the two westernmost stones of the N side partially overlap, presumably to provide additional support for the more easterly of the two. The floor of the chamber is divided into three unequal sections by two transverse septal slabs with the largest compartment at the rear. The excavation showed that the fill of the chamber had been disturbed at an earlier date, but enough survived to indicate that it had contained both inhumation and cremation burials. In a pit at the SE corner of the largest compartment, there was a deposit of 2500 marine shells. Part of a lozenge-shaped flint arrowhead, a few Neolithic potsherds, some hazel-nut shells and marine shells were found scattered in the disturbed fill of the central compartment. At the S end of the forecourt, and below the level of the blocking material, there was another pit also containing about 2500 marine shells. The finds are in the Glasgow Art Gallery and Museum. NR 9856 9727 A watching brief was undertaken in November 2006 during the construction of a new access path into the garden to the N of the visitor centre and immediately W of the chambered cairn. The foundation for the path was only 0.1 - 0.2m deep and simply removed the topsoil. Although no archaeological features were discovered a range of artefacts was found including 19th- and 20th-century pottery and glass along with two flakes of flint. Archive: NTS SMR and NMRS (intended). Derek Alesander and Diane Gorman, 2006. The central part of the lower area of the NTS garden at Crarae is dominated by the impressive remains of a Neolithic chambered cairn. The cairn is one of the Clyde type cairns (Henshall 1972, 324-326). Although much denuded the original cairn appears to have been trapezoidal in plan 33m long, around 22m wide at the east end and tapering down to 3.5m wide at the west end. There was an almost flat façade of upright stones with drystone walling between at the west end flanking the entrance into the chamber. The chamber was constructed of three compartments divided by two septal slabs. The chamber and narrow strip in front of the façade were excavated by Jack Scott of Kelvingrove Museum between 1953 and 1955. The work was recorded in great detail especially the interior of the chambers which prior to excavation still retained 1.2m deep of in fill. The position of all the finds and bones were recorded in three dimensions (Scott 1963). Human remains from at least three individuals were identified. Burnt bones from the central and inner chamber were from an adolescent or young adult aged 14-20 years old and a 25-35 year old adult. The third individual was represented by unburnt bones and appeared to be a small adult were also found. Artefactual remains included a flint lozenge-shaped arrowhead, sherds of pottery and 2 fragments of later rotary querns. A large pit in front of the façade and another in the interior of the inner chamber were each found to contain 2500 marine shells. More recently the samples of bone excavated in the 1950s and kept in Kelvingrove Museum have been analysed as part of a study into diet during the Mesolithic-Neolithic transition (Schulting & Richards 2000 & 2002). This work obtained two radiocarbon dates. The first was from a human bone phalanx from within the chamber and gave a date of 4735±40 bp (OxA-7662) giving a calibrated range of 3640-3380 BC. The second sample came from a cockle shell from within the pit in the end chamber and gave a date of 5545±35 bp (OxA-7880) giving a calibrated range of 4240-3780 BC. Stable isotope analyses of the human bone also indicated that the diet of those buried in the cairn was based mainly on terrestrial animals such as sheep, cattle and pig rather than on marine resources. This was despite living on the banks of Loch Fyne and also despite the presence of the two deposits of sea-shells.